The management of urban solid waste and the generated sludge in urban treatment plants face important challenges in the framework of the circular economy according to the guidelines set in the European Union in recent years. The adaptation to this new context, where waste is valued as a source of resources, goes through the adoption of technological solutions to recover energy or materials in a viable and sustainable manner. This conference brings together public-private actors involved in the management of sludge and urban solid waste where it shows innovative technological solutions that arise from the close collaboration between industry, administration and technology centers or universities. The event will be in Spanish. For further information, check the offficial website of the event. 1.- Ceit, Manuel Lardizabal 15, 20018 Donostia / San Sebastián, (Spain). 2.- Universidad de Navarra, Tecnun, Manuel Lardizabal 13, 20018 Donostia / San Sebastián, (Spain). 3.- Depuración de Aguas del Mediterráneo (DAM). Avenida Benjamín Franklin, 21. 46980 Parque Tecnológico, Paterna, Valencia (Spain). 4.- Entidad de Saneamiento de la Región de Murcia (ESAMUR). Complejo de Espinardo - Ctra. N-301 C/Santiago Navarro, 4 1a Planta 30.100 Espinardo, Murcia (Spain). 5.- Ingeniería y Desarrollos Renovables (INDEREN). Av. Artal de Foces, 46290 Alcàsser, València (Spain). En este trabajo se presentan los resultados de la implantación de la digestión anaerobia seca como alternativa de tratamiento para lodos de estaciones depuradoras de aguas residuales (EDAR) urbanas que no cuentan con digestión anaerobia. Estos resultados están enmarcados dentro del proyecto europeo LIFE-ANADRY (ENV/ES/000524), cuyo objetivo es demostrar la viabilidad técnica, económica y ambiental de la tecnología de digestión seca en EDAR urbanas de tamaño mediano y/o pequeño (<100.000 hab. eq.). Concretamente, este estudio recoge la evaluación de la operación de un prototipo pre-industrial de 20 m3, cuyo diseño permite la mezcla completa de lodo deshidratado y que cuenta con una caldera dual para el aprovechamiento del biogás. Se ha evaluado la implementación de la digestión seca en temperatura mesófila (35oC) y termófila (55oC), bajo condiciones de operación distintas en relación a la carga orgánica volumétrica (COV) y el tiempo de retención (TR). En línea con los objetivos del proyecto, se ha valorado el rendimiento del proceso en términos de eliminación de materia volátil, producción de biogás y metano, y en términos de higienización, cuestiones clave para demostrar la viabilidad de la alternativa planteada. Es destacable que el seguimiento del prototipo LIFE-ANADRY refleja rendimientos superiores operando en rango mesófilo de temperatura a un TR de 20 días, lo que indica una mejora considerable respecto a la operación a 55oC. The works of the Alguazas water treatment plant have been completed and will provide 1,200 cubic hectometres of reclaimed water to the irrigators in the region which is an area of ​​1,521 hectares. The general director of Water, Sebastián Delgado, accompanied by members of the municipal corporation of Alguazas, visited the facility and reported that "this volume of water is in an excellent quality, the plant, built in 2014 and with capacity to serve a population of 162,000 inhabitants, already has tertiary treatment. " The actions in this purifying station, in which 200,000 euros have been invested, have allowed to increase its energy efficiency. The Ministry of Water, Agriculture, Livestock and Fisheries will allocate 2 million euros until 2019 in actions in 20 municipalities "with the aim of saving energy costs in the operation of each plant, by installing photovoltaic energy." 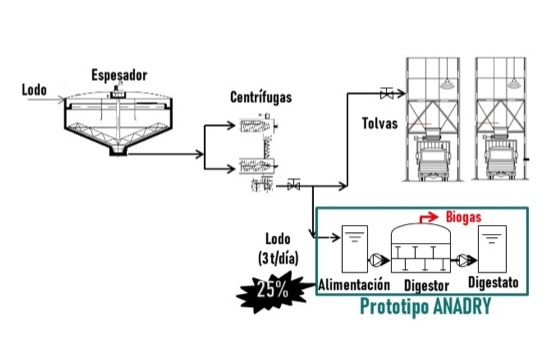 In Alguazas WWTP, Life-Anadry project is developed as an alternative for the management and treatment of sludge which is co-financed by the European Union within the Life program. On 5th June 2018, members from the projects of Life-Anadry, LIFE Ammonia Trapping and LIFE IN-BRIEF had a networking activity in Alguazas, Murcia. During this activity, the participants had a chance to exchange & present the progress of the projects, results & good practices. From 23rd -25th May 2018, Sludge Management in Circular Economy (SMICE2018) conference took place in Rome, Italy. SMICE2018 is part of the IWA Specialist Group on Sludge Management (SGSM) conference series, conceived as an international forum discussing state-of-art, practical applications and problems around sewage sludge. Sewage sludge management problems are common all over the world and best solutions, according to affordable costs, have to be suited to specific territorial contexts. Europe is now world promoter for the transition from the linear to the circular economy. Six new directives are about to be approved by the European Parliament and this will drive Member States to the adoption of new strategies and politics to maximize waste recycling. IFAT is the World's Leading Trade Fair for Water, Sewage, Waste and Raw Materials Management, and is a place where visitors can find strategies and solutions for using resources in intelligent cycles in a manner that ensures their long-term preservation—with a great deal of success. This year, the trade took place from 14- 18 May 2018 in Munich gathering thousands of visitors from all over the world. Life-ANADRY was presented as an innovative solution for waste water treatment plants in a stand together with SAVING-E by ESAMUR, Ceit-IK4 and INDEREN. Life-ANADRY project consortium held a technical meeting on 13th April 2018 in Alguazas, Murcia in order to discuss the progress of the project and its planned activities for the coming months. The meeting included a visit to the LIFE-ANADRY prototype and was joined by Patricia Serrano representing Neemo. During the meeting, partners discussed the main results obtained so far and the most relevant conclusions of the operation and monitoring of the prototype. The prototype is now performing under mesophilic conditions where results look very promising. The consortium also showed the most relevant results about the dissemination plan and the networking activities carried out so far. Finally, discussions on the next actions concluded the meeting together with the technical visit.